Yesterday was the Underground Farmers’ Market in San Francisco. My initial plan involved walking over to The Mission to get some exercise before gorging myself in the underground. Instead, I lazily took the MUNI to 18th street where on the way, I was “accidentally” seduced by a chalk board that boasted exciting flavors at Bi-rite Creamery. I couldn’t restrain myself. 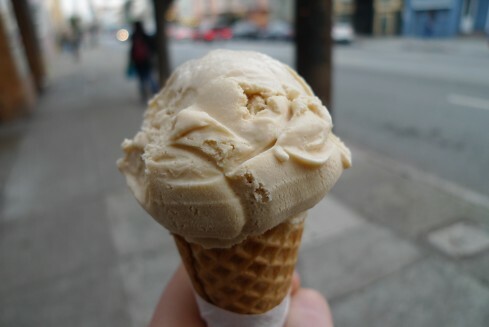 I ended up with a cone of earl gray, which I blissfully ate as I walked through the neighborhood. You know… to prime my stomach. 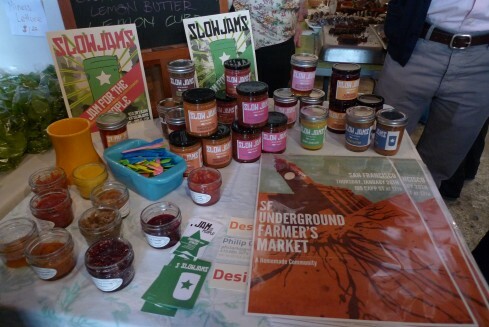 The SF Underground Farmers’ Market is an event that allows small time vendors to get their businesses off the ground and test the market with their wares. It’s been organized by Iso Rabins from Forage SF, who has done a brilliant job of putting together a great community of vendors and people looking to support the local food movement. This location was in a moderately awesome space on Capp Street. 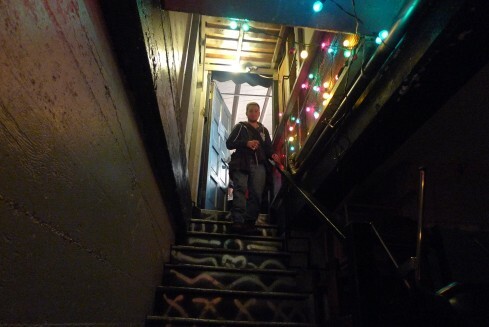 (Up a mysteriously lit set of stairs, which evoked memories of basement raves at M.I.T. Yep. Nerd.) Despite arriving punctually at its 5pm opening, the place was already packed! 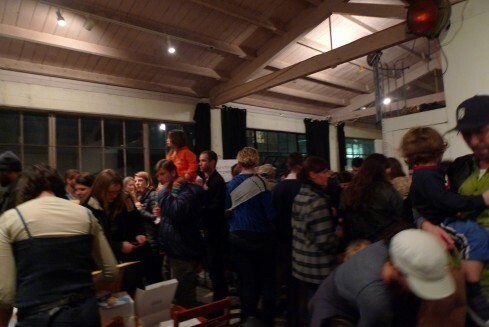 I heard from Iso that he had a list of over 600 people signed up, and there were more registering at the door. There was a plethora of options and the market was heavily skewed towards gently prepared foods: ranging from sauerkraut, kombucha, honey, chocolate, mushrooms, pies, lasagna, bread, and sandwiches. There was live music, families with small children, and plenty of happy, food lovin’ people to share the evening with. Fun! 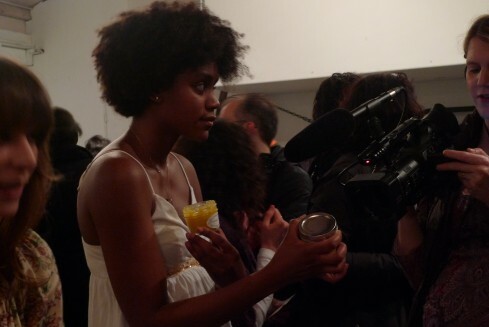 My first big stop was to see Shakirah of Slow Jams (this lovely lady below, being interviewed on the camera). I heard tell that her Blood Orange and Meyer Lemon Marmalade was to die for, so I snatched one up before anyone else could get to them. I also managed to score the lone jar of her Milk Jam, which Jessica from the Golden Crust was using in some amazing cream puffs she was selling at the market. After making my initial rounds, I ended up purchasing a jar of raw local honey from Oakland, two Slow Jam jams, and a few bags of delicious Treat granola (which was stirred into my morning oatmeal with great success). While there, I ate a fair deal more than that, including my absolute favorite food of the evening: the corned beef sandwich from Pearl’s Kitchen, with lightly spread mustard on caraway bread. Pictured below is a woman holding said Manna from Heaven. Where my Jews at? Can’t these people open a deli in San Francisco? I’m pleading! I could have eaten three of these. Don’t miss out next time! SF Underground Farmers’ Market is gearing up to be a monthly event if Iso can swing it. How: It’s free! But sign up is required. Sign up HERE to be on their mailing list. My CSB (baker) Pandora’s breadbox was participating, wish I had made the effort to get there, it looks fantastic. I will have to check it out next month, looks like a lot of fun. My friends left with some of their beautiful bread! This morning when I woke up breadless I was regretting not doing the same..
.-= Lauren (Pearl’s Kitchen)´s last blog ..pearlskitchen: Thx to this blog! 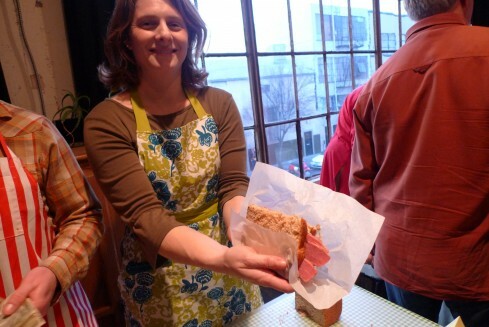 Our corned beef = manna from heaven http://www.thesecondlunch.com/2010/01/sf-underground-farmers-market/ =-. I had a great time at the underground market, too. Brought my friend Leslee who appreciates good food. We shared the heavenly corned beef, and all I can say is- “next time get your own sandwich, Leslee! “I had to sit down to bring my awareness to every tender bite, and then go back to the vendor to let them know how much I adored it! Loved the miner’s lettuce, and the black mushrooms- went home and put them in a salad to go with the empanadas I bought. WOW- food coma. Who needs drugs with food like that? Not me.